Bella Vista was established in Peter's Creek, Alaska in 1977. The owner, Bobby Alefantinos and his sons personally ensure quality in everything that leaves their kitchen - from the delicious pizza dough to the marinara sauce. Bobby believes that each customer is important....there is no mass production at Bella Vista, and it shows with every bite. Drop by and see the "Bella Vista" - beautiful view - for yourself. Ask to see the full beer and wine list when you come to dinner! Fruit flavors along with subtle toasty oak are framed by well balanced acidity and tannins. The finish shows great structure with well integrated and resolved tannins. Aromas of lemon zest, honeysuckle and Kaffir lime marry together forming an inviting and delicious entry to this wine. 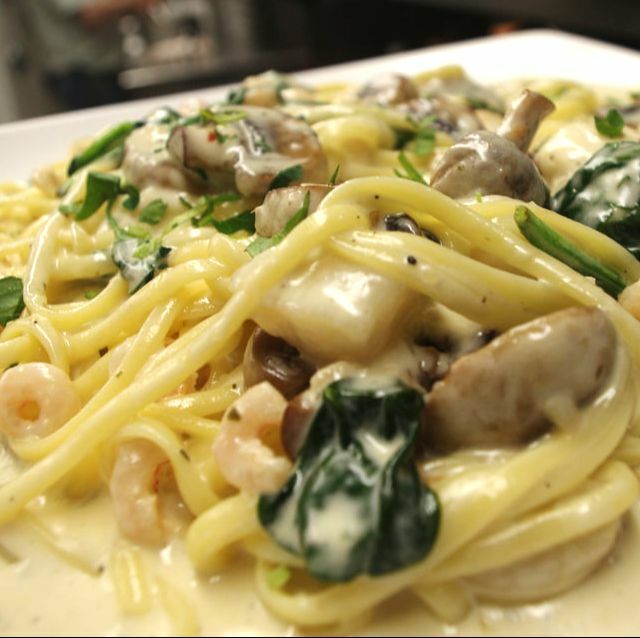 Shrimp, Scallops, Halibut, Mushrooms and Spinach in a Cream Sauce. All of Bella Vista's pizzas are hand tossed & made fresh daily. Call for free delivery! Please call us to make a reservation. We are happy to accommodate special requests! We love special events and can accommodate parties of up to 100. Please get in touch with our head server to get more information and to discuss booking. ​to the baseball fields, sledding, skiing, kayaking, bike trails and more, there is something waiting for you nearby. Make a day of your meal with us and find adventure in the Land of the Midnight Sun.